Reading and agreeing to the Terms & Conditions of an online casino website is one of the most important things you need to do before betting real money, yet it is admittedly a part of the process many players tend to gloss over. 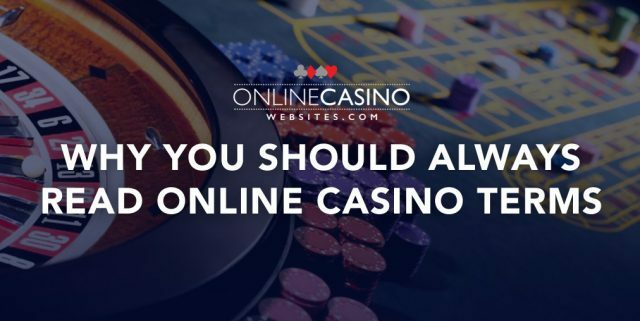 While the recurring joke that nobody ever really reads the T&Cs extends to any type of registration, it is arguably much more crucial that anyone who puts down their hard-earned cash for Internet gaming needs to take the time to do so if you expect to get winnings back to your account. This article aims to break down why you need to read the terms and conditions of each online casino you sign up with, and the elements of T&Cs you need to watch out for in particular. The 2017 Annual Report and Accounts for the United Kingdom Gambling Commission, one of the world’s most trusted advanced gaming jurisdictions which regulates a vast majority of the best online casino websites, revealed over 77% of gamblers in the region have not read the terms and conditions of their chosen real money casino site. They also found female players and those over the age of 65 are less likely to read terms and conditions than other demographics. The published figures are unsurprising, given the wealth of complaints and queries logged all over the Internet in forums regarding problems with online casino’s T&Cs, which a majority of the time are after the player puts down real money and realises there is a potential problem they did not expect or research. The editorial team at OnlineCasinoWebsites recognises problems with gambling T&Cs is often not the player’s fault at all – there may be extra stipulations buried in walls of text, or important conditions attached to bonuses, promotions and deposits that are poorly worded, confusing or overly ambiguous on the part of the casino. However, we cannot stress enough that regardless of how boring it looks or how tedious it is, you must always read the T&Cs before signing up anywhere, and move on if there is anything that you don’t agree with, seems unfair or ultimately just looks like a scam casino. Before signing up to an online casino, it pays to figure out whether you’re even eligible in the first place. Many sites often don’t elaborate on region exclusions and age restrictions outside of their fine print, so you will have to find this information buried in their Terms and Conditions. Thankfully, using the text search command via CTRL + F (Windows PCs and Microsoft Surface tablets) or COMMAND + F (Mac OS X, Macbook, Macbook Air) makes it relatively easy and fast to find these things. Just search along the lines of ‘exclusions’, ‘excluded countries’, ‘age’ and you will 99% of the time find a full list of countries the online casino does not accept, and the minimum age required (18 in most parts of the world). One other thing to note is even if the online casino accepts players from your country, sometimes their advertised sign up bonuses aren’t claimable due to local/state gambling laws. Agent Spinners Casino, for instance, advertises a free spins bonus to players from all countries it accepts, but the offer is actually only available to players from Finland, Norway and Sweden. It’s not necessarily deceptive or misleading, but it can lead to unnecessary confusion. Always check the T&Cs for further information and follow up with the customer service representatives if you ever find you can’t redeem a certain welcome package and see if you are eligible for specialised offers catered to your country. It’s safe to say the majority of real money online gamblers prefer to retain their privacy, but to bet on the Web and withdraw any winnings, it is inevitable you will need to provide some personal information to successfully (and legally) do so. Online casinos always include a section outlining what kind of basic information (date of birth, name, email address, contact phone number) and personal identification documents (driver’s license) they require from you prior to processing payouts or accepting your registration entirely. All in all pretty basic requirements, but given many people still complain about not being able to withdraw winnings because they didn’t provide ID means not enough people read these sections of the T&Cs. Just set aside a few minutes to confirm what’s needed and you can avoid a lot of headaches. Wagering requirements (also typically called playthrough requirements or rollovers) are stipulations attached to almost all sign up bonuses, promotions and other monetary rewards offered at an online casino. These conditions usually require any player who registers and redeems a casino bonus to wager a certain amount of the offer – usually 20X or 50X the size of the bonus. For example, if a bonus comes with a 35X wagering requirement (which tends to be the most typical rate), it means you will need to spend 35X the amount of your redeemed bonus across the online casino’s games before you can withdraw your bonus money and any additional winnings you may have scored with it. Wagering requirements are often included in print underneath individual bonus offer pages, but its rules are often buried within the Terms and Conditions itself. Some sites such as Bovada and Joe Fortune consider certain games on their sites as contributing more towards the wagering requirement than others; bets on online slots, for instance, might contribute 100% towards the playthrough rate, while games like blackjack count 60% and games like Craps might be excluded entirely. These additional conditions are often very obscure or glossed over on the main pages advertising such sign up bonuses and offers, so it always pays to look at the T&Cs to understand what is expected of you when redeeming big cash bonuses. There are many stories of players getting lucky and winning a boatload of cash thanks to the help of their generous starting bonuses, only to get frustrated or confused as to why they cannot withdraw the entire winnings amount immediately – avoid this but getting up to scratch with playthrough requirements and sites with the lowest bonus rollover rates. From the operator’s point of view, wagering requirements are imposed to ensure their bonuses are not abused by new players (who may try to sign up just to use the free bonuses and then abandon the account if they lose) and to keep them from bankruptcy (as if a player is able to win a fortune off free bonuses with no strings attached, the site would not exactly be in a great position). Bonuses often don’t just come with wagering requirements attached to them; there are many other stipulations you need to be aware of, such as bonuses expiring after a certain amount of time has passed. For instance, online casinos such as Leo Vegas state in their T&Cs that they “reserve the right to withhold and remove any bonuses awarded to you if such bonuses have not been used within one (1) month from the date when they were awarded.’ To avoid any nasty surprises, make it a general rule of thumb to take advantage of bonuses credited to your account as soon as you are awarded them. This is the sort of stuff that is always important to know, but can get easily lost or forgotten during the initial excitement of signing up to a new online casino with a generous welcome bonus to burn through. Educate yourself and never skip past the T&Cs before reading the fine print to confirm what kind of extra costs are associated with payments.